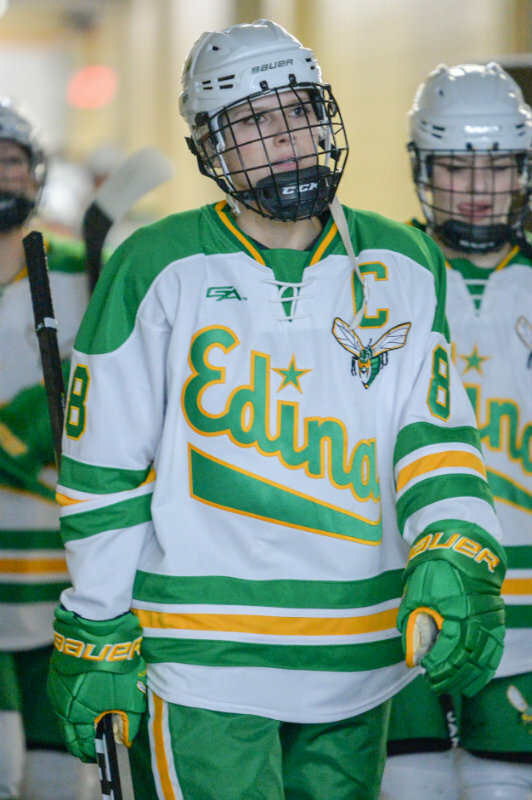 In addition to celebrating its third consecutive Class 2A state championship victory, Edina can enjoy having three of its skaters being honored as part of this year’s big-school all-tournament team. The top-seeded Hornets, who defeated No. 3 seed Brainerd/Little Falls 4-3 in double-overtime at Xcel Energy Center in St. Paul on Saturday, are represented by Mallory Uihlein, Vivian Jungels and Annie Kuehl. Blue-liners Uihlein and Jungels delivered a big sting to opposing goalies throughout the state’s 25th girls’ hockey tournament. The duo combined for eight points, with Uihlein registering four assists, while Jungels tallied two goals — including one on the power play in the championship game — and a pair of helpers. Despite having just concluded her freshman season, Jungels is already committed to playing for the Golden Gophers. Uihlein, a senior and team captain, is a Penn State signee. Kuehl, a senior forward committed to Princeton, scored a goal and tallied three assists in the tourney. Even though Brainerd/Little Falls lost the championship game to the Hornets, the Warriors garnered four all-tourney selections in goalie Olivia King, forwards Gabbie Smith and Cheyenne Abear, and defender Sophie Robinson. King was stout in goal throughout the tourney, saving 101 out of 107 total shots, good for a .944 save percentage and 1.88 goals against average. Smith and Abear notched six points apiece during the tournament. Abear, who netted a short-handed goal against the Hornets in the first period to give Brainerd/Little Falls an early 1-0 lead, registered a trio of goals and three assists. Smith, meanwhile, produced a goal and five assists. Minnetonka was the only other Class 2A program with multiple players honored in goalie Brynn Dulac, defender Maggie Nicholson and forward Lacey Martin. The Skippers, who lost 2-1 to Edina in the semifinal round, got a pair of goals and two assists from Martin. In Class 1A, Breck and Warroad each had four players honored. The second-seeded Mustangs, who beat the top-seeded Warriors 6-1 in a rematch of last year’s small-school finale, are represented by forwards Carly Beniek and Olivia Mobley, along with defender Katherine Solohub and goaltender Uma Corniea. Warroad, meanwhile, boasts goalie Quinn Kuntz, forwards Genevieve Hendrickson and Hannah Corneliusen, and defender Kaitlyn Kotlowski as its selections. The all-tournament teams, presented by Wells Fargo and the Minnesota State High School League, were selected by a panel of coaches who attended the tournaments. See the tables below to see who made each team.